At Darcy Preece Photography we photograph weddings, family portraits, grad portraits and events in Leduc, Alberta. Leduc is a dynamic family-oriented city with a population over 35,000 located 30 km south of Edmonton. Leduc was started as a village in 1899 by Robert Telford and officially became a town in 1906. One of the most popular places in Leduc received it's name from Leduc's founder Robert Telford. Telford Lake, where visitors can go boating, explore the trails, take in some bird watching or participate in numerous other activities. The lake hosts year round events including dragon boat competitions in the warmer months, and Alberta Endurance Races in the colder months when the lake is frozen. Edmontons International airport is actually located in Leduc, which has helped grow the economy since it opened on November 16, 1960. It is the fifth busiest airport in Canada and welcomes over 8 million travellers annually. With the opening of the EIA Premium Outlet Collection the city of Leduc is expected to grow even more. Lions Garden can be found east of Edmonton near Tofield on Highway 14 and Range Road 200. This venue provides everything that you will need for your wedding. They have an outdoor ceremony location complete with seating for 140 guests. The highlight of Lions Garden is definitely the rustic barn for your reception. The chandeliers in the barn are something you have to see in person! There is even a Bridal suite for the bride and her bridesmaids to get ready in. Hastings Lake Gardens is located East of Edmonton just off of highway 14. 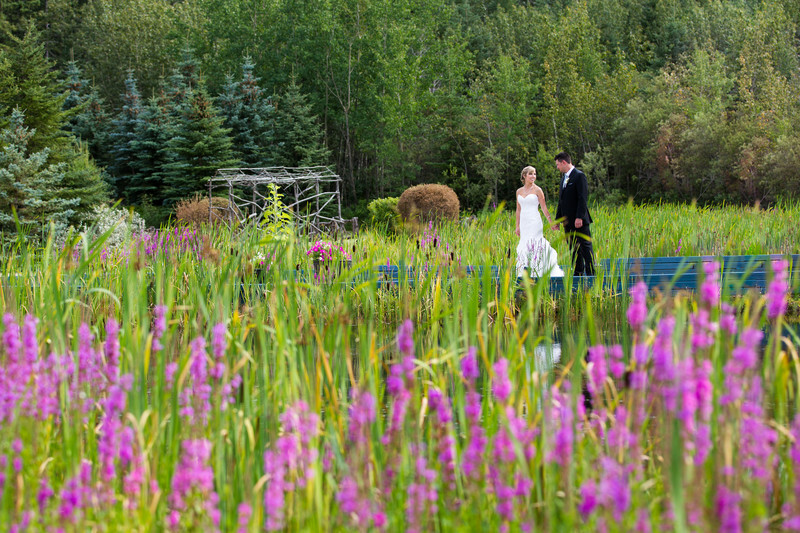 Hastings Lake Gardens is perfect for outdoor or indoor wedding ceremonies. The best part of this location is there are so many options for your wedding portraits. Dot and Terry Ziegler are the owners and they have turned the property into a wedding couples dream location. Pine and Pond can be found 45 minutes south of Edmonton and 45 minutes North of Red Deer and 15 minutes West of Ponoka at Township Rd 440, Falun, AB T0C 1H0. It is a family owned and operated wedding ceremony and wedding reception venue. This venue is quickly becoming the most popular location for natural weddings. With an indoor space at 3200 square feet you can easily hold up to 200 seated guests. Massive wooden tables, wooden cross back chairs, drapery, sound system, and projector screen are all included with your rental. If weather permits there is also the option to hold your ceremony at the waterfront outdoor sanctuary. They even have a row boat if you are feeling a little adventurous for your wedding photos. The company was started after Karleen Hildebrand had her own dream wedding with Paul out in the country. She wanted to fulfill other couples dreams of having the perfect wedding, so she decided to make it a career. With the help of her father Keith Tarry and her mother Heather, they designed the perfect place for couples to live out their wedding day fairytale. The Country Wildflower Bed and Breakfast is located 10 minutes East of Leduc on Highway 623. This wedding venue is perfect for your outdoor ceremony. The house is also a bed and breakfast so there is lots of room for the bridal party to get ready. This unique venue must be seen in person to understand how beautiful it is. The highlight would definitely be the waterfall and large pond. It makes for such a stunning backdrop for your wedding portraits. They also have nice bridges and walkways throughout the property that help make this a must see wedding venue. The Leduc Stone Barn is available for year round wedding ceremony rentals and is located in Leduc at 4613 44 Street. The Stone Barn is a cultural development site that is owned by the city of Leduc. It is also home to an original farmhouse and fully landscaped gardens. This would be a great venue for an outdoor ceremony. The Nisku Recreation Centre is available for wedding ceremonies, and receptions and can accommodate up to 200 guests. It is located 5 minutes from Leduc in Nisku and can be found at 606 18th Avenue. They offer full service packages to ease the stress as much as possible. This would include full catering from a professional staff that is experienced with quality meals in a buffet style for large groups of people. They also include hors d'oeuvres at cocktail hour, and a late night snack. The bar service is fully licensed so no need to worry about all of your licenses and insurance, they are also fully stocked with certified bartenders. Full set up and take down is also included in your rental. The Executive Royal Hotel can host any size of wedding. They have 9 conference facilities with the largest one being able to accommodate up to 400 people. They are located in between Leduc and Nisku at 8450 Sparrow Drive. The Whitewood Barn is located just 10 minutes outside of Leduc on Highway 2A. The property is an enormous 40 acres with all natural scenery around you. The highlight is definitely the rustic barn at 2400 square feet. The wedding ceremony area is in a perfect spot to capture the essence of the property. They also have a fire pit which is a nice touch to wind down the evening. When it comes to getting ready there is a private bridal suite in the house for the bridal party. It is quiet and very comfortable. The Whitewood barn is perfect for your wedding ceremony, reception, rehearsal dinner and most importantly a one of a kind location for your wedding portraits. Telford House is a wedding venue that can accommodate 150 guests and is located on 46th Street in Leduc. The hall has a beautiful patio deck that overlooks Telford Lake. The fire place and rustic decor makes this venue a great choice if you are looking for rustic theme. They have a raised stage, podium and sound system to take care of all your audio/video needs. Red Tail Landing is located 14km south of Edmonton in Leduc on Range Road 243. It is very close to the Edmonton International Airport. With a new banquet facility that can accommodate up to 250 guests, Red Tail Landing can host your wedding ceremony as well as your wedding reception. The highlight would definitely be having your wedding at a golf course! With manicured greens, waterfalls, a creek this is the perfect venue for your wedding portraits as well. Red Tail Landing offers a full service menu and bar to ease the stress of your big day. With an expert staff you can be assured that every detail will be taken care of. Sam and Jared's Wedding took place on August 6th, 2016. It was a beautiful outdoor ceremony that took place at Country Wildflower Bed and Breakfast. The ceremony started at 1:00 in the afternoon and the weather was a perfect summer day with a nice breeze to keep the bugs away. Jared got ready in Beaumont and Sam got ready at Country Wildflower. The wedding party was 5 on each side, so 12 total including the bride and groom. After the ceremony we did the family photos on location because there were so many nice options to choose from. When the family photos were finished we moved to another location with Sam and Jared. This image was taken near one of the creeks. We wanted to utilize the flowers in the foreground as much as possible. We asked Sam to pretend that she was leading Jared down the path. I think the pink flowers add a nice border to the bottom of the image and pushes your eye towards the couple. We wanted to have a nice wide image. This image was created using a Canon 5D Mark III and a Canon 70-200mm 2.8L series lens. The only difficulty with this image would have been the bugs. The reception took place at the Red Tail Golf Course. Location: 49362 range road 243 Leduc, AB T9E 2X2.